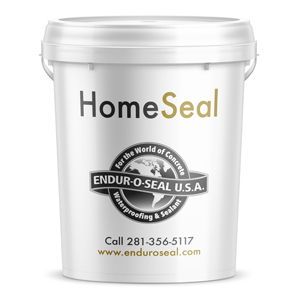 Home Seal – 150 / 200 square feet per gallon / per application. NCS-2O Negative – 350 / 400 square feet per gallon / per application. Home Seal is a concrete sealant formulated for the do-it-yourselfer. Everyone Can Enjoy A Dry, Healthy Basement Waterproofing a basement with Home Seal. It is a quick, easy, inexpensive, do-it-yourself project. Home Seal is a waterproofing concrete sealer that will never stop working. It becomes a permanent part of the concrete matrix itself. Home Seal is a two-application process that is simply sprayed onto the concrete with a low-pressure (garden type) pump sprayer. You don't have to be afraid to use Home Seal in your home because it is Non-toxic, Non-hazardous and Non-flammable. It has No VOC’s (Volatile Organic Compounds) - No Solvents. Home Seal is a water-based, fast drying, penetrating concrete sealer that has no unpleasant odor. Clean-up is with clean tap water. Home Seal does a lot more than just waterproof your concrete. It solves potential health problems associated with a damp or wet basement. Migrating moisture creates a breeding ground for mold spores and mildew not to mention that "damp basement odor". Home Seal can greatly reduce the health risks associated with the transmission of Cancer Causing Radon. It stops Radon before it enters your home unlike fan systems that allow it in and then vent it back outside. Whether you are finishing your basement to convert it into usable living space or just using it for storage, applying Home Seal concrete waterproofing sealer will make the basement a useable, pleasant, safe and odor free area. Home Seal is most frequently used in conjunction with NCS-2O Negative as a final top coat application. NCS-2O Negative is a penetrating, membrane forming sealer that was designed for securing the seal of concrete walls. If the homeowner intends on firing out his basement walls Endur-O-Seal recommends that you purchase Home Seal and NCS-2O Negative in kit form at a great 10% savings. All concrete must be clean, raw concrete, no paint or sealers. To remove algae spray down with a 50/50 mixture of Clorox and tap water. Deck brush and hose or mop down to rinse. Allow area to semi dry and apply Home Seal with a inexpensive low-pressure (garden type) pump sprayer that you can use for both products. Floor must be damp before applying Home Seal. Use clean damp tap water to dampen. Fill your sprayer with Home Seal and apply a wet application to the floors using a left- right and then up down motion for optimum coverage. Apply only enough product to create a shiny wet layer of sealer. Product will penetrate in 7 to 10 minutes. Do not let product puddle, mop up excess in low place after 10 minutes. Apply 2 consecutive wet applications of Home Seal 30 to 45 minutes apart while floor is still damp from the previous application. Use a left-right motion to leave a shiny wet application of liquid sealer on the surface. Home Seal will penetrate the concrete surface in 7 to 10 minutes leaving just a damp looking surface. Reapply the second application while the surface is still damp for best results. A 3rd. application maybe applied for extra sealing strength if desired. Use a deck brush and a liberal amount of water 6 to 12 hours after the last application, vigorously brush to remove all residual sealer and purged contaminates from all surfaces that are to be painted or have other coatings or adhesives applied. Allow sealer 10 days to cure before applying paint or another topical treatment. Allow product to cure the full 10 days before applying NCS-2O Negative. Use a dry deck brush and vacuum to remove any purged lime or dust that may be on the surface before applying NCS-2O Negative. Using the same clean sprayer apply NCS-2O Negative in a left to right and then a up down motion for complete coverage. Allow a maximum of 1 hour for NCS-2O Negative to begin it's curing process and then repeat a second application. Do not allow the product to puddle after 20 minutes, mop up excess from low spots. After and between applications clean your sprayer with clean tap water, run pressurized water through the nozzle. Fill your sprayer with Home Seal and apply a wet application to the walls spraying from the top down using a left right and then up down motion for optimum coverage. Apply only enough product so as not to create run-off of the Home Seal. A 12 inch sag in the sealer is maximum. Repeat the application within 30 to 45 minutes. Apply 2 consecutive wet applications of Home Seal 30 to 45 minutes apart while wall is still damp from the previous application. Use a left right, up down motion to leave a shiny wet application of liquid sealer on the surface. Home Seal will penetrate the concrete surface in 5 to 10 minutes leaving just a damp looking surface. Reapply the second application while the surface is still damp for best results. A 3rd. application maybe applied for extra sealing strength if desired. Using the same clean sprayer apply NCS-2O Negative in a left to right and then a up down motion for complete coverage. Allow a maximum of 1 hour for NCS-2O Negative to begin it's curing process and then repeat a second application. Do not allow the product to puddle.